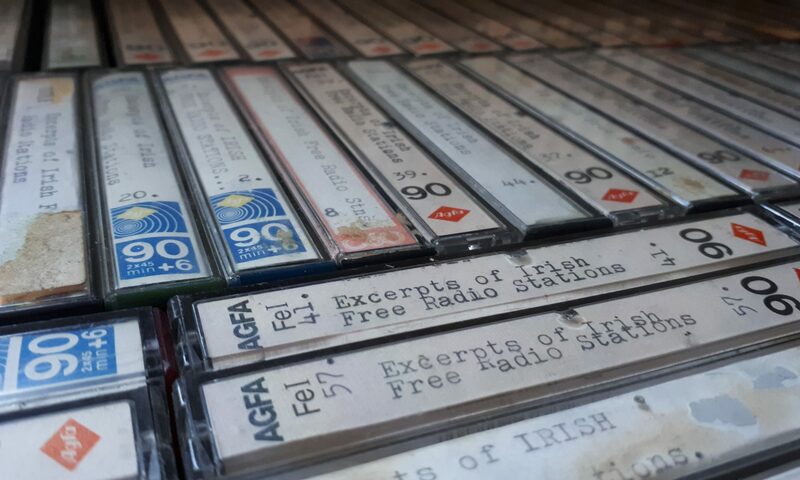 CAU FM was a short-lived station broadcasting on 103.5 and later 104.2 FM from Foxrock in south Dublin from mid-1987 until mid-1988. It had its origins in low-power hobby stations set up by Locky Butler and evolved into Phoenix FM. Phoenix began on 25 watts but grew to a 250 watt transmitter before being ordered to close down by the Department of Communications in 1987. Within an hour of the order being delivered, the TX was moved to a site on Three Rock overlooking Dublin and CAU FM was born. CAU had a good signal all over Dublin, professional sound and slick jingle package. 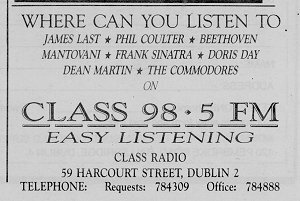 We’re reliably informed that CAU stands for ‘clutterfree and you’ and certainly the station played a lot of uninterrupted music. This full-length recording from 1988 (unfortunately we don’t have a date) includes jingles, ads and links from Locky Butler’s show and gives a good flavour of the sharp on air sound. There’s also a promo for a holiday giveaway! CAU was sold to the religious station Hope FM in the summer of 1988. Thanks to Locky Butler for additional background information. You can listen to an aircheck of this recording here.